1 How do you know if something is alive? 2 What is every living thing made up of? 9 List the 8 characteristics of life. 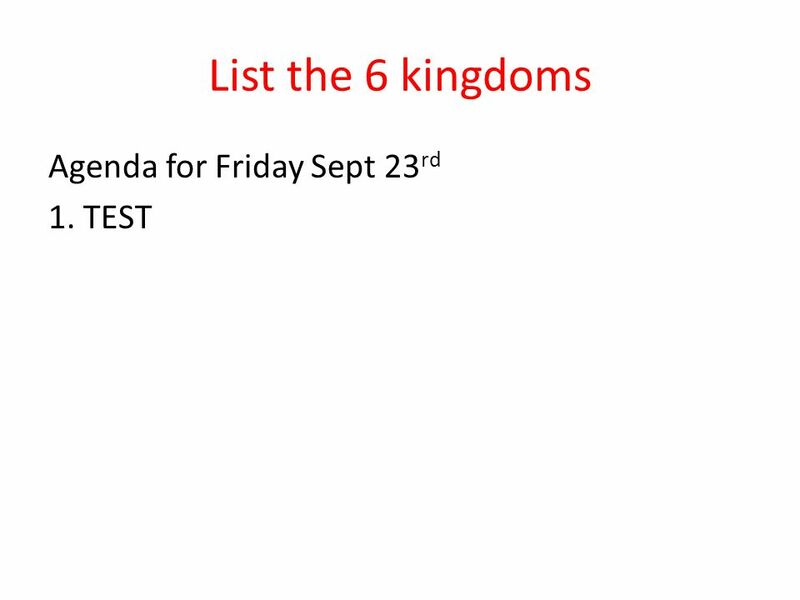 Agenda for Thursday Sept 22nd What is life 6 kingdoms Review Learning Targets Define biology, homeostasis, metabolism, adaptation. 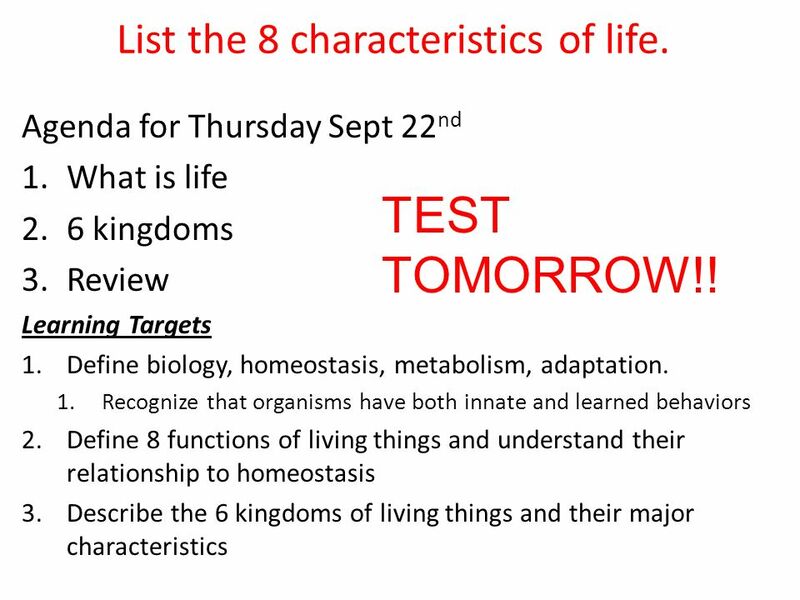 Recognize that organisms have both innate and learned behaviors Define 8 functions of living things and understand their relationship to homeostasis Describe the 6 kingdoms of living things and their major characteristics TEST TOMORROW!! 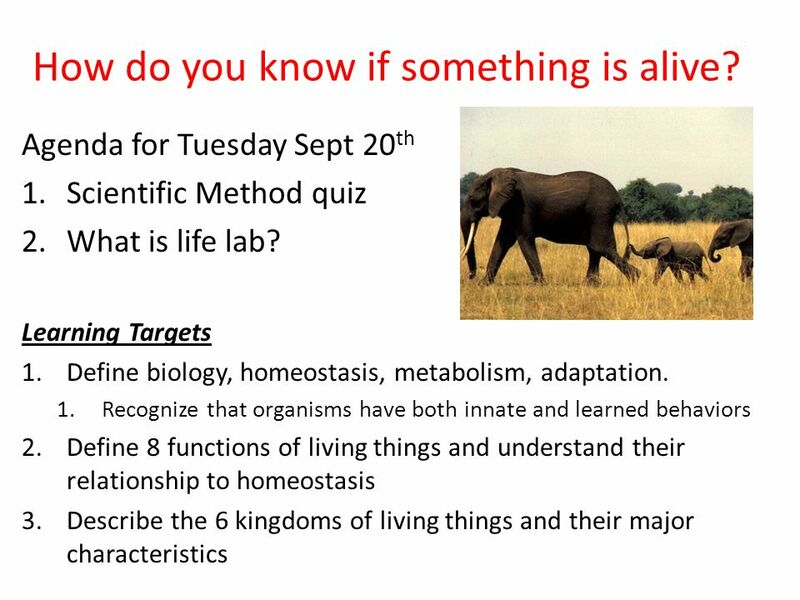 Download ppt "How do you know if something is alive?" 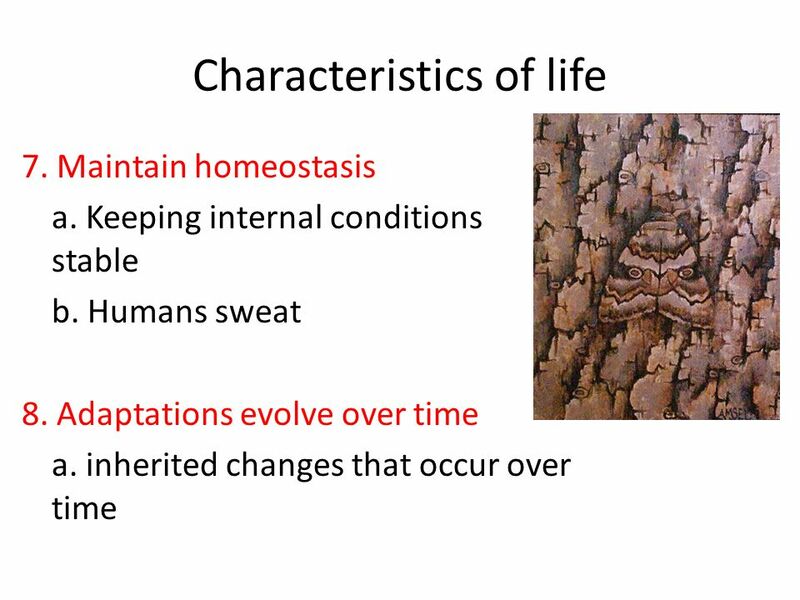 The characteristics of living organisms. All living things are made of cells. have DNA obtain and use energy. Excrete wastes grow and develop. reproduce. 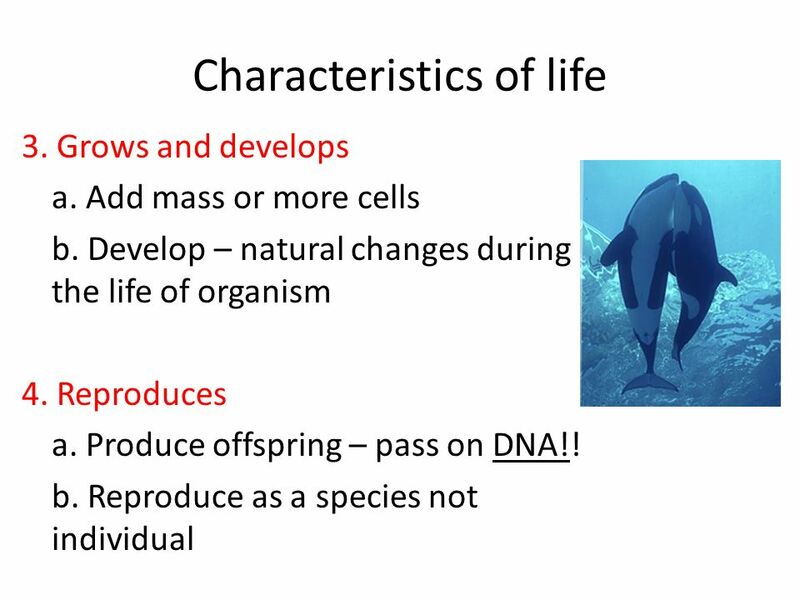 Biology Bio (life) logy (study of). Characteristics of Living Things. BELL RINGER [3 Minutes] 1. ESTIMATE how many buttons are on this device. 2. Make one OBSERVATION about this object. 3. Make an INFERENCE about what this. What makes something alive ? 5 topics that we will cover this year 1.Introduction to science. (inquiry) 2.Life science 3.Physical Science 4.Chemistry 5.Earth Science 1.Introduction. 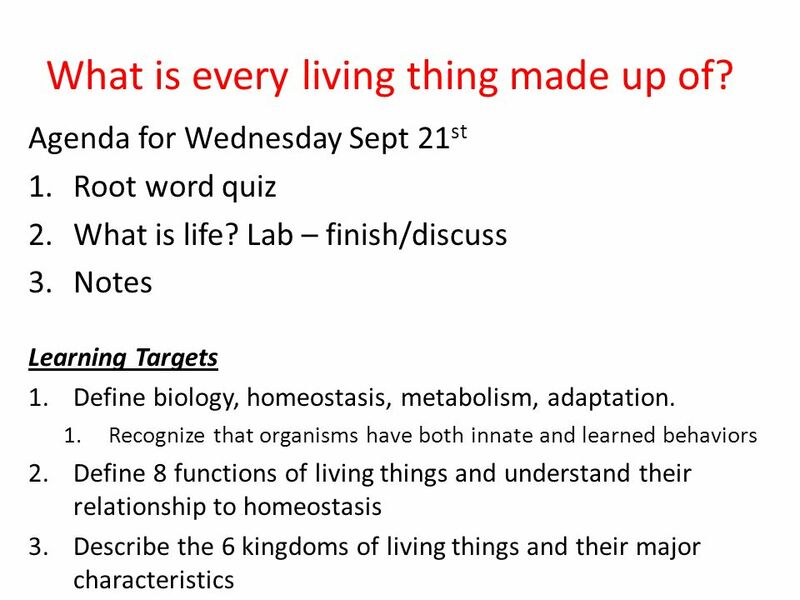 Introduction to Biology and Life Science Mrs. Margreiter. 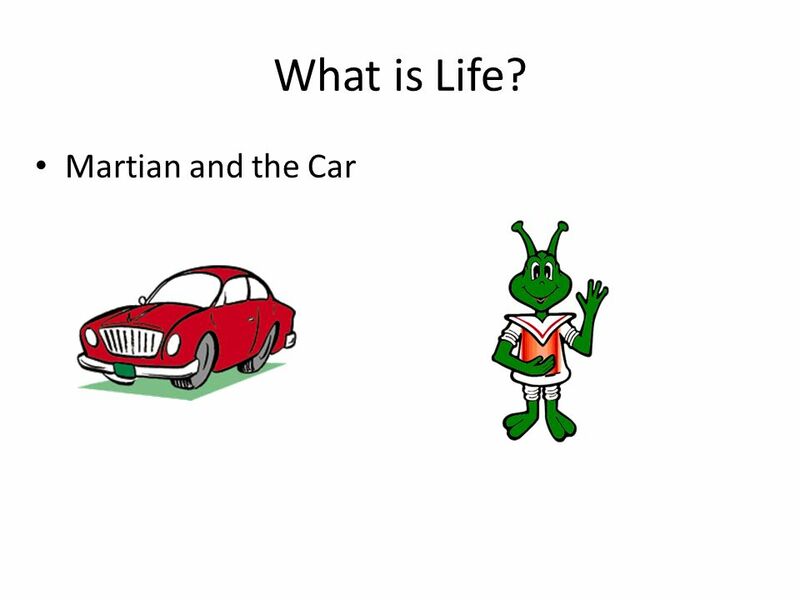 What are the characteristics of life? 8 characteristics all living things have in common. What is biology? 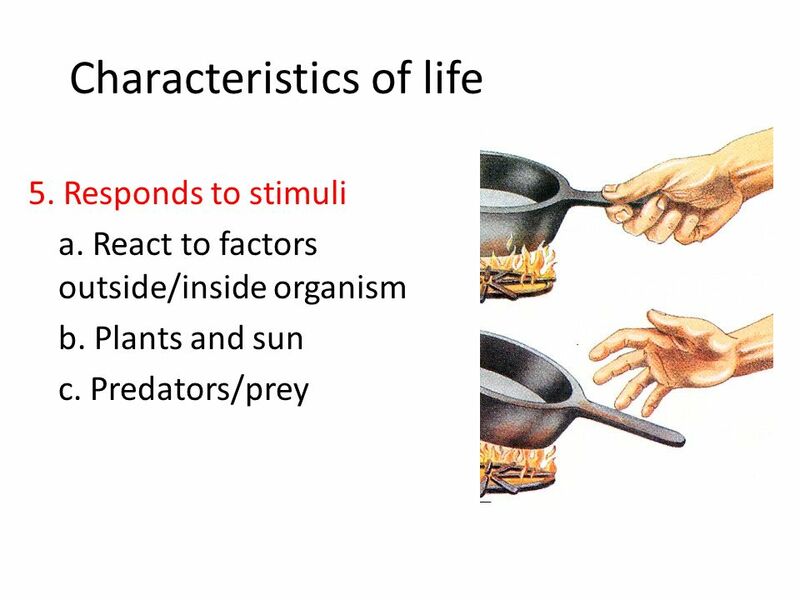 Biology is the study of living things (organisms). 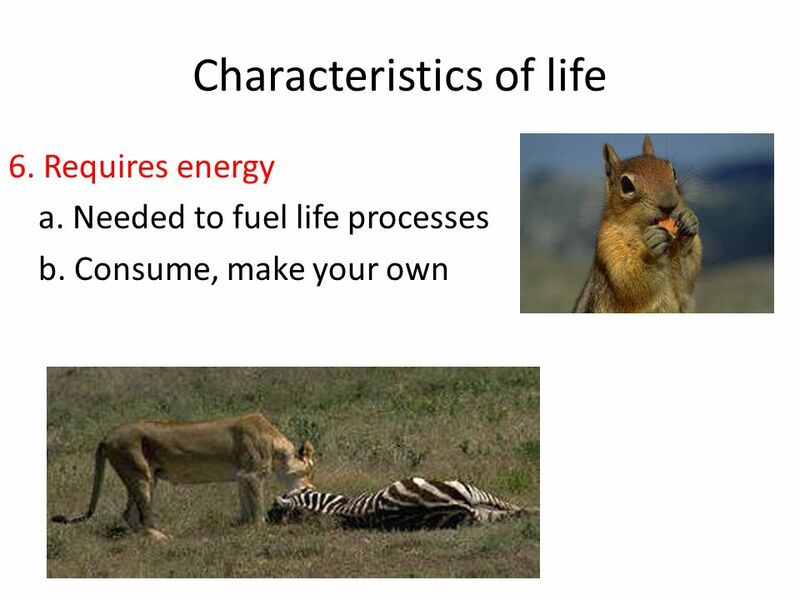 Characteristics of Life. The Eight Characteristics of Life  1. Made of one or more cells  2. Displays organization  3. Grows and develops  4. Reproduces. 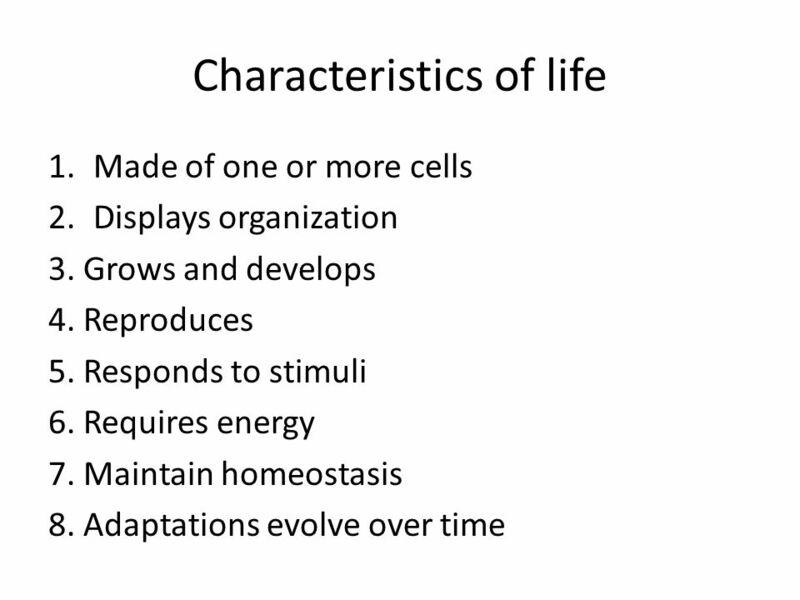 CHARACTERISTICS OF LIFE BIOLOGY: the study of life. Characteristics of Living Things. What is biology? 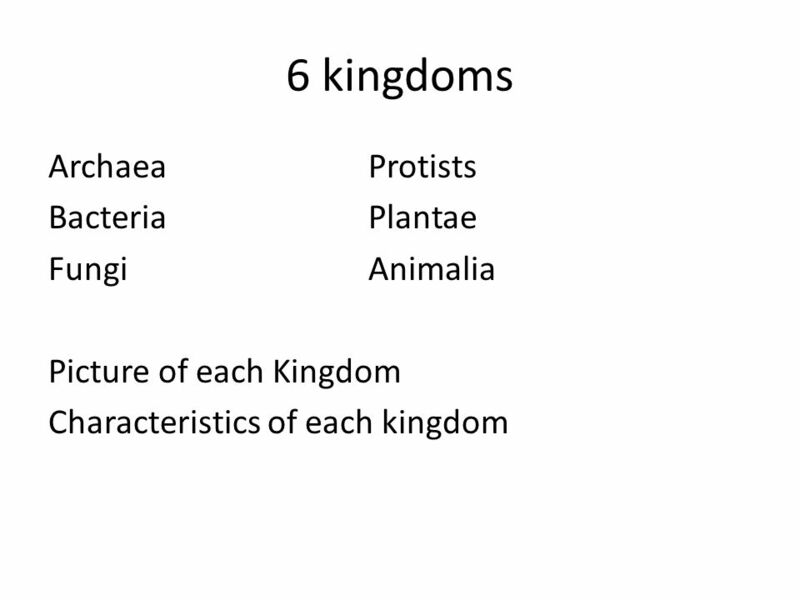 The study of living things All living things share certain characteristics. Characteristics of Living things. 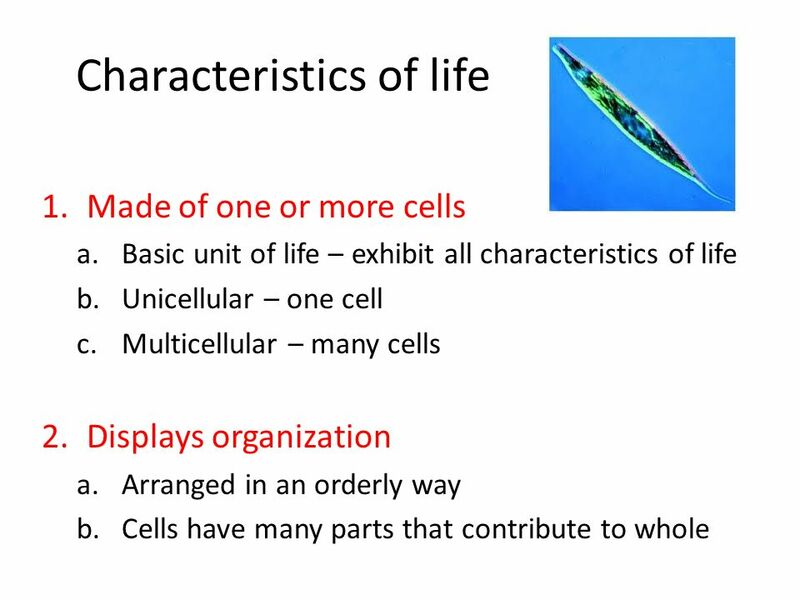 All living things have cells “Basic unit of life” Unicellular- made of only one cell Multicellular- made of 2 or more.